A group of area farmers is on its way to Nebraska with a caravan loaded with donated items to help farmers there who are suffering from ongoing flooding and a blizzard that hit the area this week. 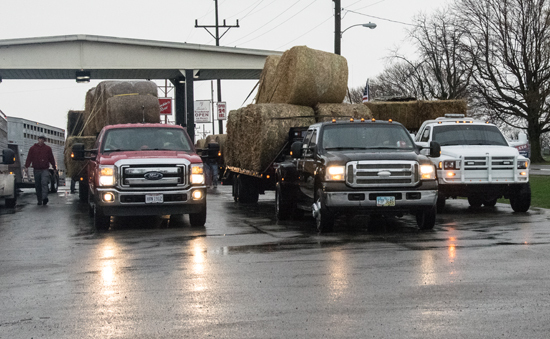 Tony Miller, one of the organizers of the local relief effort, said a total of 18 vehicles, which includes pickups pulling trailers full of hay and other items, as well as semi-trailer rigs, are involved in the effort. “A couple of us thought we would get a few loads and head out, and this turned into what we have,” Miller said of the relief caravan loaded with donated items. The caravan also includes tools to deal with mechanical issues while on the trip. Miller said the group started talking about doing something for Nebraska farmers about a week and a half ago, and decided this weekend was the latest they could go and still be able to do their own spring planting. This group, while larger, is the second group of area farmers to take relief items to Nebraska, Miller added. After sending out a request for donations, organizers started doing some research to see where in Nebraska they would go. Miller said they decided on Verdegre, Nebraska, a town in northern Nebraska that was one of the hardest hit by the flooding, but has received less aid than other parts of the state. 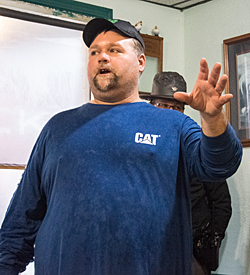 The group planned to stop overnight Friday in Adair, Iowa, where Miller said they had 15 motel rooms reserved for the night, and then reach Verdegre on Saturday. Miller said the group had a Plan B — Ithaca, Nebraska — if the recent blizzard made the Verdegre area too difficult to reach. Miller said the decision of which town to go to was to be made Friday night after some more conversations with contacts in Nebraska. In addition to donations, each of those taking the trip to Nebraska is giving up a day of work to make the journey. “Everybody going has full-time jobs, so they’re all taking the day off,” he noted. Plans are to arrive back home sometime Sunday.